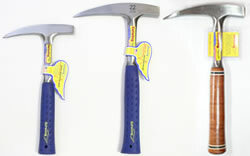 Geologists usually use pointed-tip rock hammers in areas of metamorphic and igneous rocks. The flat end of the hammer is used for breaking rocks and for light chisel work. The pointed end is used to loosen rocks embedded in soil and as a digging tool. 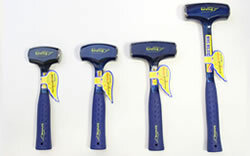 The 14-ounce hammer is used for light work and by people who prefer a light-weight tool. It also weighs less in your backpack. The 22-ounce hammer is the standard-size for most work by most people. Important Safety Tip: It is very important to wear eye-protection every time you use a rock hammer, and, rock hammers should always be carried in a sheath to reduce the chance of injury. These are the standard hammers used by geologists in areas underlain by sedimentary rocks. Jobs done with the flat end of this hammer include: breaking sedimentary rocks, trimming sedimentary rocks, light chisel work. The curved blade of the hammer is used for splitting sedimentary rocks, digging and other work. The hammer is sold in three weights: 16, 20, and 24 ounces. Pick the one that matches the type of work that you are doing, how much weight you are willing to carry, your size/strength/skill level. Important Safety Tip: It is very important to wear eye-protection every time you use a rock hammer, and, rock hammers should always be carried in a sheath to reduce the chance of injury. These sheaths fit the pointed-tip and chisel-tip hammers sold above. They are not interchangeable. Both close with a snap-button. The chisel tip sheath covers the entire hammer head but the chisel-tip end is open. The pointed-tip sheath covers the entire hammer head but the pointed-tip end is riveted closed for safety. For safety reasons, we always recommend carrying your hammer in a sheath while in the field and removing it before you get into a vehicle. 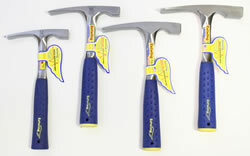 These are short but heavy hammers used for breaking rocks. 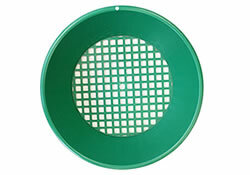 The smaller ones are sometimes used for chisel work or drilling. They are sold in 2, 3 and 4 pound weights. All three weights are about 11 inches long. 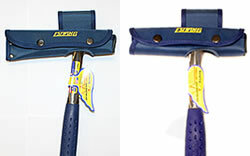 The 4-pound hammer is sold with a short handle and a longer handle. The long handle hammer is about 14 inches long. Important Safety Tip: It is very important to wear eye-protection every time you use a rock hammer, and, rock hammers should always be carried in a sheath to reduce the chance of injury. 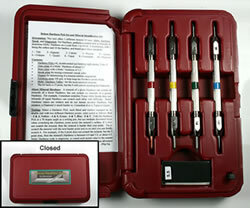 These pencil-like hardness picks enable you to do more precise and accurate hardness testing. The tips are made with special alloys that approximate the hardness of minerals in the Mohs Scale for hardnesses of 2, 3, 4, 5, 6, 7, 8. 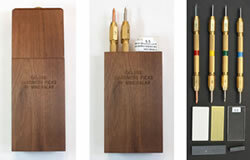 Available in a plastic field case or a wooden case for the office. Knowing the hardness of the rocks you are tumbling helps you identify them and know which rocks are compatible for tumbling together. Get a close-up look at your polish. A great polish should be absolutely smooth when viewed at 10x. If you see a matte finished at 10x it is possible that you can tumble a little longer and improve the luster. 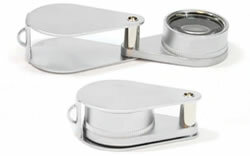 This lense has a metal loop for attaching a lanyard and a pivot hinge that allows it to be closed for storage. Don't use a rock hammer without wearing a good pair of goggles to protect your eyes. 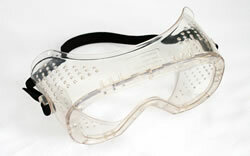 These goggles have lots of small ventilation holes and they fit over most prescription glasses and sunglasses.